Classic hardy perennial for Autumn height, colour and impact - and so easy to grow. Producing stunning warm golden amber flowers, with classic black centres. Goldsturm is a variety that is more compact than some at 70-80cm tall. Spreading to clumps about 40-50cm wide, often producing 10-15 flowers or more. Hardy perennial so will die back underground each year, producing bigger and better displays. A simply fantastic autumn flowering perennial that will light up your garden for years to come perfect for adding warm, end of season colour to your borders! Goldsturm produces masses of uniform, golden-yellow flowers, each with a rich brown centre. These flowers will look spectacular against the deep green foliage, when many of the plants in your garden are starting to fade. 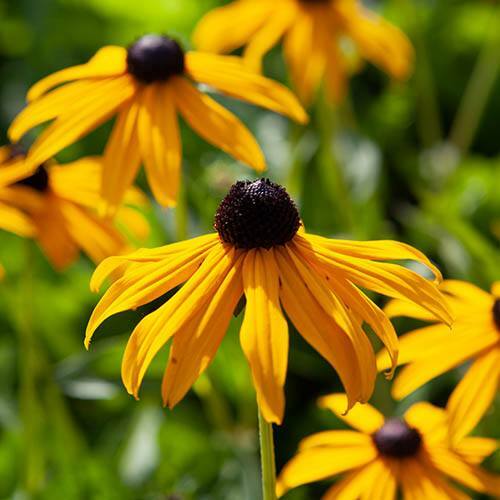 Totally hardy, even in the harshest winters, Rudbeckia Goldsturm is very easy to grow and will flower its socks off! Compact and manageable, reaching around 50cm (20) tall, it is perfect for planting in borders, or you could plant all three plants in a large pot. Awarded the RHS Award of Garden Merit for its brilliant all-round performance in UK gardens.